This bike was a few years in the making. Actually, about six. Maybe a year before we broke up, I spotted an old bike for sale across the road from my then-girlfriend's house. It was a Rudge Whitworth, and nice enough to get me talking with the owner. It turned out that he also had an old Specialized Rockhopper, a rigid 'old school' MTB, and not for sale. Well, I passed on the Rudge, but that Rockhopper made me want a rigid mountainbike. My first MTB had started life with no shocks, and I still lusted after that lost simplicity. Sure it's a cliché! Don't all clichés have a grain of truth to them? Looking around, I saw a few fully rigid bikes that woulda worked but did not. 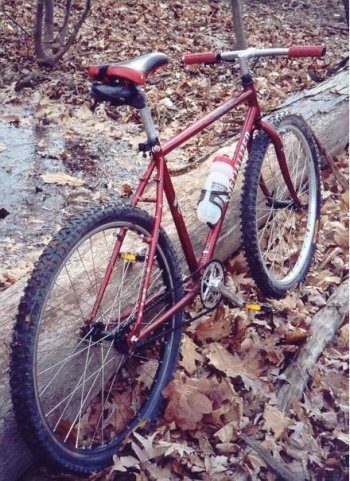 I shelved the idea until, a few years later, I came across a nice old Specialized Hardrock. I built it up as a fix with a 700c wheelset, plus cross tires, drop bars, and 39x18t gearing. It became FGG #1530, and slightly famous. Unfortunately I needed that 700c rear wheel for a roadbike that I took to the '05 Five Borough tour, so the Specialized sat neglected in a corner of the garage. Tired of cleaning, and of wearing out my roadbikes on snowy roads, I determined to build a winter bike. At first, it was going to be a singlespeed, but then it came to me: why not fixed? So I started to put together a bike in my head. I wanted a true mountainbike fix, 26" rims and all. My first choice was a Trek 4500, but I soon found that the aluminum frame and front shock didn't handle the way I wanted. And so the rigid Specialized was reborn, with Surly S/S hub and track cog, 36x16 gearing, Bontrager Jones MTB tires, and a flat bar with a front brake. I took the bike out for the first time on a slowly warming winter's day, with the temperature hovering around 39 degrees inside my garage, according to the digital readout on the wall. Outside the wind was blowing, and although the sun was out behind cloudy skies, it was darn cold. 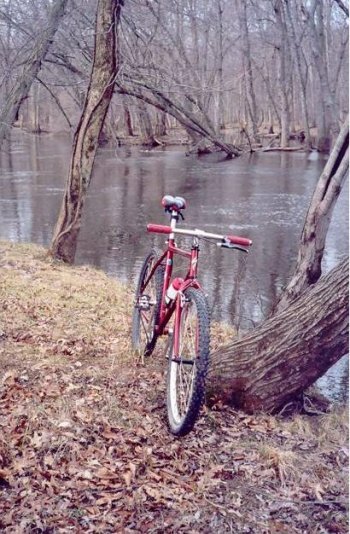 The bike handled fine on the semi-frozen dirt, leaves, and twigs, tho' I didn't try hopping any of the large logs I saw. That's for another day, if I feel up to it! The trail disappeared under the front wheel and it didn't take much effort to avoid pedal strike. Braking was easy -- the front cantis were dialled in perfectly, and the low gear allowed easy resistance braking. Props to Surly! Their stuff is not cheap, but it is made well enough to justify the extra outlay. I am 195lbs now and the rear wheel held up A-OK in the woods, ruts and all. I stopped around the river's edge to take in the view, and indeed what a view! If anyone asks you why on earth you would ever take a fixed MTB offroad, this is why. A few days later, I made my next test ride, a route between two towns through the woods. It wasn't a proper MTB trail, so there were a lot of creek carries, ditch-hops and slogs over downed tree trunks. I rode the lot, and it was mad fun! Awesome to the 'T'! If you have never built a 26" fixed for offroad, you don't know what you're missing. Hats off to Surly, and yes, even Specialized -- their mid-90s vintage steel frame rides better fixed than it did with gears. The only foreseeable future changes are trimming the handlebar -- I didn't cut it exactly even on the left side -- and the installation of the rear brake when I can find a matching lever! Brian Matula recently graduated with a degree in English. He has been tinkering with bikes for while but recently got the fixed bug.